I am ashamed to admit that I do not take the time to lotion my skin often, but I have used and currently do have the Suave Vitamin E Body Lotion. It works pretty good although there's nothing special IMO about it. Then again, I am not much of a lotion expert. I prefer using pure Vitamin E oil. It's absorbed through the skin and there are no additives. It's hand wash so there's really not much to tell. It seems to get my hands nice and clean and I really like the variety of scents that they carry. I get it from the dollar store, so the price is not too shabby either. Overall good product at an affordable price. Great stuff! I have an issue with sunscreens making my face SUPER oily. So far this one is the best as far as not leaving an oily residue. Easy to apply, doesn't slide off my face and into my eyes when I sweat (ouch!). So far this is my go-to sunscreen. 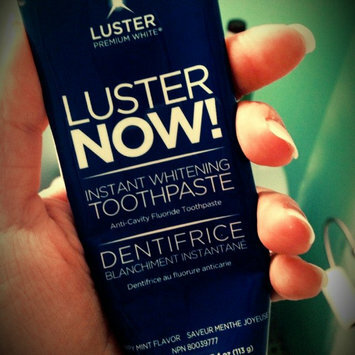 This stuff really works and it's as simple as brushing your teeth twice a day...because that's all it takes! I love how white my teeth look and I don't have to sit 20 minutes a day with strips over them to get the results! Lancome cleansers are the best! I've been using them for about 2 years now and I see a noticeable difference in my overall skin complexion. For reference I have combination skin with minor (but frequent) breakouts. However, it's subsided since I began using this product. Our family fights over control of the iPad. It's easy to use, works great and I can download educational games for my son. Love all my MAC products. My only complaint is that when something malfunctions, it's almost cheaper to just buy a new replacement. They're wonderful for graphic design, which is what I do professionally. You just cannot get the picture quality and resolution on a PC the way that you can on a MAC. It's not the worst frozen pizza there is. The hamburger one is pretty tasty. It's always been a little too much for just me. I share with my 5 year old son. It does not taste so great after it's been sitting though. This isn't like regular pizza that tastes good hot or cold. I love this stuff! I usually hate/forget to take pills but these gummies are so easy to pop in your mouth and go. Makes my nails strong, and I can tell bc they used to shred like paper. I've been a faithful customer for several months now! Very pleased with the results!! !